To secure the function of any security door, it's critical that an automatic closing device such as a door closer is in place. 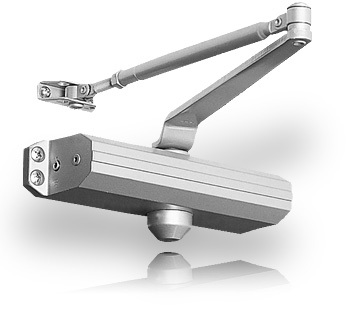 Pre-Lock Security offers a wide selection of high-quality door closers for any need and any door. Door closers are an integral part of many commercial and semi-commercial door sets including residential garage doors. They maintain the integrity of fire doors along exit routes in buildings used by the general public. The self-closing function offered by door closers also provides an important level of security for external doors that will insure that no one can just sneak into your building. Door closers also are key in preventing doors from slamming, staying open unintentionally or blowing open in the wind. Pre-Lock Security sells, installs, and services a variety of door closers ranging from surface mounted door closers, concealed door closers, door stays, floor closers, screen door closers to electromechanical door operators and closers for a variety of different needs.